Los Angeles hair transplant options are growing by the day, and for good reason. Los Angeles, California has long been credited for influencing American culture, and indirectly western culture as a whole, since the early 20th century when film and television began permeating our homes. With that came the glamour of Hollywood and the drive for physical perfection, for better or for worse. That is why when most people think of cosmetic surgery they think of Los Angeles, and more specifically, Beverly Hills. This means that to be successful in Beverly Hills you have to be on top of your game but the basics for how to operate a successful cosmetic surgery do not change no matter where a clinic is located. This means that on top of having great results on a consistent basis a clinic must also exhibit an understanding of how to take care of their patient. There has to be a base level of empathy that is among the technicians, the office staff and of course the doctor or doctors in the practice. There has to be a genuine concern for how a patient is taken care of after having their hair transplant procedure in addition to before and during their hair transplant procedure. This is why I'm happy to be able to recommend Dr. Baubac Hayatdavoudi of the Alvi Armani hair restoration clinic in Beverly Hills, California. First, a bit about the background of "Dr. B.". Dr. Baubac Hayatdavoudi is from Jefferson City, Missouri and went to medical school at the University of California, Irvine, and he completed his residency at UCLA/ Wasdworth where he also received his board certification. He apparently was a stand out in that he was voted "resident of the year" for each year of his residency. I'm normally not impressed by basic medical background qualifications but to be voted the "resident of the year", much less every year you're a medical resident, is a pretty big deal. 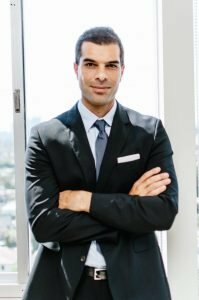 As a Los Angeles hair transplant surgeon, Dr. Baubac performs only follicular unit graft procedures on a daily basis and this leads to why I think he's an interesting Los Angeles hair transplant doctor to consider. When I was speaking with Dr. Baubac about his practice I learned that he is very particular about being the only person to perform the FUE extractions. This is a big deal to me and while it isn't a requirement to be a Hair Transplant Mentor™ partner doctor it certainly does help and is what I prefer for my own head. While technically, I believe it is illegal for non-doctors to perform hair transplant surgery in California I understand that it still happens, even in the Los Angeles hair transplant market. But what is interesting about this is that while the Alvi Armani clinic is an FUE only clinic, Dr. Baubac has incorporated facets of the FUSS procedure into his FUE procedures. What I'm referring to is the use of stereoscopic dissecting microscopes. Why is this important? Well, it is a point I'll be discussing in ongoing Hair Transplant Class series of videos where I will educate you about what makes a "natural" hairline. What I've observed for the past few years is that as FUE becomes more and more popular I'm seeing the quality of work and what is considered to be "natural" decline overall when compared to work that was being produced ten years ago. The advantage of using stereoscopic dissecting microscopes, as introduced by Dr. Limmer over twenty years ago, is that the grafts that are being extracted can be properly viewed by the technicians to discern whether or not that single hair follicular unit really is a single hair follicular unit. Most FUE only clinics do not use microscopes and because of this their hairlines are pluggy. They will have many more multi-hair grafts in the hairline than would have been found with a proper FUSS procedure. I find this to be an important part of any hair transplant procedure to insure a natural result. Dr. Baubac of course goes beyond the use of microscopes to get natural results. He was telling me in one of our discussions that he doesn't understand how a doctor and team can properly perform an FUE procedure and get the most natural results possible if the doctor isn't doing the surgical aspect of the procedure him or herself. To expand on this, he feels that when he's making the overall plan for the procedure he gives specific thought to the size of the graft that will go into each area of the hairline and wherever else the grafts are to be placed. This in turn dictates how many grafts he will extract that are single hair follicular units, doubles, triples, etc. This helps him to understand the canvas, so to speak, as he is then making the incisions for the grafts to be placed into. It also helps to be a hair geek and from speaking with Dr. Baubac I have come away with the impression that he really enjoys not only the science of hair restoration but the artistic side of it as well. This is reflected with the work he does as seen in the many videos and photos found on his website. Hair transplant education is very important to Dr. B and we share many of the same ideas and philosophies when it comes to what makes a good hair restoration candidate. Dr. B is a big believer in the use of medication to maintain a patient's existing hair and how this can affect the long term plan for how any procedures are to be performed. When Dr. Baubac has patients coming in to inquire about Los Angeles hair transplant options he'll oftentimes turn them away if he feels they are not ready for a procedure or have not taken the time to understand the long term necessities that are involved with surgical hair restoration. I think that the way you treat your staff is a big part of how everyone works together to insure that everyone involved with the procedure has a strong desire to do the best work they can. I think it speaks volumes that every one of Dr. Baubac's staff have been with him from the start of his own FUE only focus which started in 2010 after several years of performing high quality FUSS along with his FUE. This makes the Los Angeles hair transplant team at Alvi Armani one of the more experienced FUE only teams around. This also helps to insure that there is a strong consistency with the work being performed as having a rotating door of technicians due to a poor work environment only hurts the patients in the long term. This is one of the things I look for in clinics I consider working with and Dr. Baubac at Los Angeles hair transplant clinic Alvi Armani shares the same philosophy. Dr. Baubac and I also discussed at length the measures he goes to insure the safest environment possible for his patients. If you're a regular reader of this website you know that this is a big deal for me when I'm evaluating new clinics that wish to become a Hair Transplant Mento™ partner. Dr. Baubac has designed a proper internal protocol for infection control during the procedure but also for after the patient leaves so that there are no surprises during the recovery period. And speaking of the recovery period, Dr. Baubac and the Los Angeles hair transplant clinic of Alvi Armani have made patient care after the procedure a strong priority in their day to day operations. I don't like hearing about patients that can't get in touch with their clinic after they've had their procedure or that haven't heard from their clinic in many months. This is another big deal for me that I look out for and Dr. Baubac addresses this area very well. I like what I've learned when doing my research about Dr. Baubac and the Alvi Armani Los Angeles hair transplant clinic. Dr. Baubac is the president of the company so he's got a deep interest in all facets of his clinic and he wants to make sure that everything about the experience with his clinic is as good as it can be. 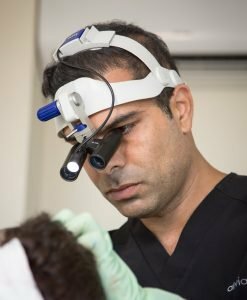 It helps also to know that he too is a hair transplant patient so he knows what it is like to have a hair transplant and he understands not only the excitement of having the procedure but he also can empathize with the trauma of losing hair and having to do the research necessary to get it back. Dr. Baubac is now an accepted member of the IAHRS, which is a core requirement for Hair Transplant Mentor™ consideration, and he obviously has the results that propel him to the top of the list of your Los Angeles hair transplant options. With everything I've seen so far and after having spent hours speaking with Dr. Baubac and his office manager I'm happy to say I finally have a Los Angeles hair transplant doctor that I can recommend for my readers that are looking for a solution to their hair loss problems in Southern California. To see and learn more about Dr. Baubac and the Alvi Armani Los Angeles hair transplant clinic, visit them online at www.alviarmani.com.